Superbly recorded drum samples, a huge variety of kit and mic options and all the control you'd ever want. Complete control over each kit element. Excellent dynamic and MIDI control. Customise kit sounds and instantly recall them. 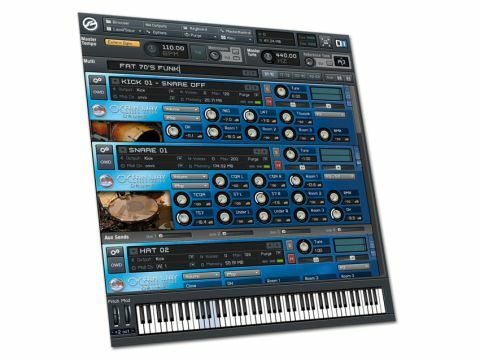 This rhythmic ROMpler features nine multi-sampled drum kits, each of which was recorded in Ocean Way's Studio B and runs in NI's Kontakt Player 2 software. When you load each kit you're given various options, the first being whether to have snare on or off. Having the choice is great and which you go for will depend on the music and how you want to treat the sound. The other option is MIDI mapping. You can pick straight GM or Ocean Ways own IMAP, which gives you a far more comprehensive and expressive key set than the standard GM. There is also a map for those using a Roland V-Drum system. Once loaded, each kit piece has its own control panel where you can adjust its pitch, pan position, individual levels of the dry and the three stereo ambiences, and in the case of the snare and kick, the levels of different close mics on the drum itself. Beyond that you can adjust the velocity sensitivity and even the attack and release characteristics of the dry and ambient signals. It sounds complex (because it is) but after a few glances at the manual it becomes easy to understand and work with. With all the mics available, getting a basic mix up may sound daunting but Allen Sides and Steven Miller (the engineers who recorded the sounds) have made life easy by providing six mix presets for each kit, ranging from the close and dry to the monster ambient. "Once loaded, each kit piece has its own control panel where you can adjust its pitch, pan position, individual levels of the dry and the three stereo ambiences." Pick the kit you want, get a groove going and then flick between them to see which sits best with the track. With all those controls you can tweak the sound to your heart's content later, but the presets give you the broad strokes of the brush to help the creative juices flow. Each of the nine kits sound great and whether you use them to program a complete drum part or just sound replace a few elements of a live kit you won't be disappointed. There is so much variation in tone available with all the options that we never found them lacking. Add to this the fact that Kontakt has a built-in mixer and effects that you can insert on all the individual elements of the kit and you have a very powerful production tool indeed. Be warned, this is a processor-heavy instrument and you need to run it from a dedicated drive. We had some trouble getting a full kit into a couple of mixes where we had a lot of plug-ins running but when starting a track from scratch we did have it running alongside three tracks of AmpliTube and a couple of virtual synths without any bother. You can buy extra kits from the Ocean Way website (there are currently 19) and the site offers plenty more information. These are among the best sounding multi-sampled drums we have used. The system is flexible enough that in a mix situation you hardly need to use any extra plug-ins on them, and that's about as good a recommendation as you can get.